New poll shows Likud trailing Blue and White by 5 seats but right-wing bloc growing by 2 seats. A new poll published Friday by Israel Hayom and i24NEWS, showed that if elections were held today, the Blue and White party would receive 33 Knesset seats while Likud dropping further behind with 26. The poll also showed the right-wing bloc growing, gaining a total of 66 Knesset seats while the center-left bloc would receive 54. 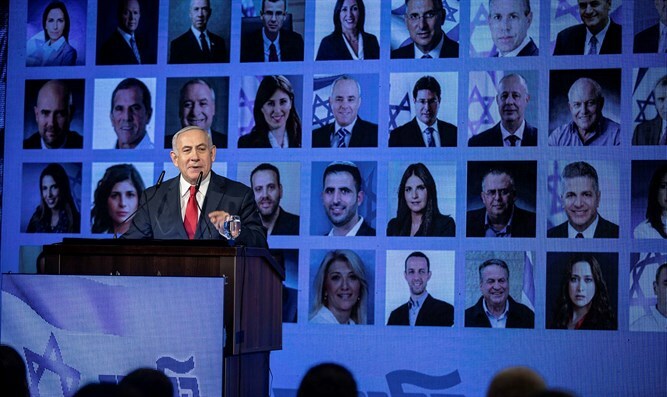 Recent polls have shown Likud as receiving only three Knesset seats less than Blue and White, and the right-wing bloc as receiving 64 Knesset seats while the center-left receives 56. The left-wing Meretz party would receive eight Knesset seats, while the United Right, Labor, and the Ashkenazic-haredi UTJ would each receive seven Knesset seats. The New Right party and the Arab Hadash-Ta’al parties would each receive six Knesset seats. Passing the electoral threshold with five Knesset seats each are Moshe Feiglin’s Zehut party, the Sephardic-haredi Shas party, former Defense Minister Avigdor Liberman’s Yisrael Beytenu party, and Finance Minister Moshe Kahlon’s Kulanu.